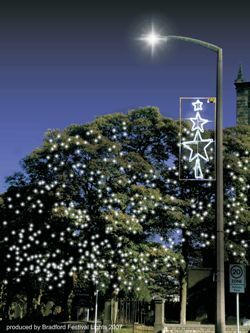 In the autumn of 2007 a few like minded residents realised that Sowerby was one of the few communities within Calderdale that didn't have any festive lights at Christmas. A village meeting was quickly called, at the Rushcart inn, and the show was on the road. We were up against it from the start as there was no money available from Calderdale Council for either the purchase of lights or the putting up and taking down of them. We developed a group of corporate sponsors, friends of the village, who provided most of the money in the first year to provide a small display around the Church, the Rushcart and the Vicarage in only 2 months. Not a bad result from a standing start, we are sure you will agree! In 2008 the fundraising commenced in earnest with a Race Night, Promises Auction, a Cabaret Night and various raffles. The corporate sponsors were supporting us once more and at Christmas 2008 we were able to extend the lights through the village including a "Merry Christmas Sowerby" banner for which we also had to purchase a new lamp post! Fundraising has continued through 2009 to 2010 to purchase more features and add to the pea lights in the trees of the churchyard. For Christmas 2010 there was further additions, by way of small "add ons" to the existing features. The committee urgently need more support from Sowerby residents to maintain what we have achieved so far and hopefully support the various fundraising events that will occur throughout the coming year. In 2011 the Church Stile Inn was lit up, there were add-ons to the existing features, the lights in the church trees were completed and we also had our first Christmas Tree on Sowerby Green. For 2012 there will be special features on The Rushcart Inn and Church Stile Inn and, for the first time, we will be extending the lights down St Peter’s Avenue around Ryburn Valley High School, Sowerby St Peter’s Cricket Club and Sowerby Tennis & Bowling Club. If you feel you can help in any way, by becoming a member of the Committee, or helping with fundraising, then please telephone 834114 or 831090. Full details of the various fundraising events will be published on this website. Keep your eyes on it!